Have you lost someone dear to you? A brother, sister, parent, grandparent, family member, friend or a child? A relationship? A body part to cancer or an accident? Do you want to experience the joy of moving from broken to blessed? From GRIEF TO GRACE? Do you want God to take your hand and teach you how to dance…with Jesus? Yes? 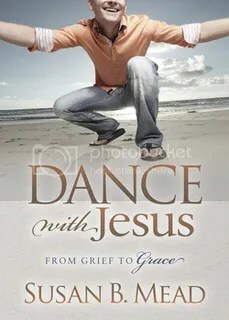 Purchase your copy of Dance with Jesus From Grief to Grace at Amazon, Barnes and Noble, BAM, Powell Books or look for it at your local Christian book store. Susan B Mead is a woman in AWE of God and how much He loves each one of us. Her desire – share stories of hope so we can see God’s hand at work in our lives. Dance With Jesus: From Grief to Grace was written as her answer to “what does God want you to do right now?” in the Experiencing God Bible Study. Susan spent 22+ years with Johnson & Johnson prior to losing her youngest son. She realized that things get broken, discarded or replaced, yet people matter. She chose to retire early to make time for the people who matter most to her, including you, a dear reader. Susan’s credentials include BS, MT(ASCP), MBA and IFOC Sr. Ordained Chaplain. She holds certification from the International Critical Incident Stress Foundation in Critical Incident Stress Management (CISM) for Individual Grief, Group Grief and Grief following Trauma. You can find out more about Susan by visiting her at her website, book website, Twitter, Facebook, LinkedIn, Amazon and YouTube. When I saw this up to review through CWA I knew it was something I needed to read, I’ve experienced people before passing away – I’ve lost an uncle, Great Grandparents, all of my Grandparents but losing a husband is something I thought I’d do when I was much, much older or maybe I’d go first because what do I do without my love? Also losing our first baby, then almost losing our oldest two years ago after major surgery, then hubby’s hear issues and eventual pacemaker surgery, losing our home – yes, I’ve had my share of various grief and these were just in the 13 years of marriage. This book was a quick read and did have comforting words in them, some of the ideas aren’t all Biblical but they definitely were a comfort, so one needs to be careful even in the midst of grief when reading this book. Susan intends for the book to be short because she recognizes when one is in the grips of grief their attention span isn’t long and so spending time on a long book not written for non-professionals isn’t what one needs. I appreciate this. Susan, herself is no stranger to grief losing close family members to cancer, to suicide and a lethal combination of alcohol and drugs – she knows grief. As I said though there are some things I do want to caution about this book and the first is that Jesus sent Susan ‘visions’ – I’m in no way saying Jesus doesn’t give us words and dreams to comfort or guide us but I’m as yet undecided in regards to how He handles suicide. This may bother some of my readers but I’m no stranger to depression and suicidal thoughts or attempts and I do know God is anti-murder. She receives several visions that Jesus assures her that people who lost their lives to suicide are His. She also uses “Heaven is For Real” which is a book I cannot recommend however I won’t enter into that here. 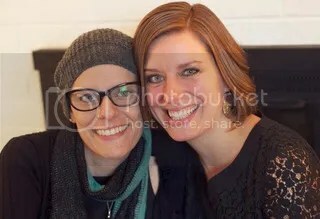 She also mentions that she is with her sister in law as she is on her death bed and she tells her that she is once again going to be with her husband, Allen, and Susan tells us that she doesn’t want to get into a religious debate on whether we’ll be re-united with our spouses and/or loved ones in Heaven. Even while I have some reservations about a few things in the book, this was still a good read for me, the questions at the end of each short chapter allows for a bit of reflection but not so much that one going through the grieving process will be even more emotionally taxed. One of the questions was “Have you felt God’s hand in your life” and another “Do you have a tattoo or know someone who does” – it helps in evaluating where you are and how you view things. There isn’t a lot of Scripture except maybe a verse at the beginning of each chapter, I would have liked more of that sprinkled through out. Overall, it was a quick read and one that I would probably give to a friend who is going through grief especially a friend who is well grounded in God’s Word. Fewer than one hundred outsiders have joined the Old-Order Amish—and stayed—since 1950. Marlene C. Miller is one of them. In this rare memoir, Marlene recounts her unhappy and abusive childhood, how she throws herself into cheerleading and marching band, and how she falls in love with Johnny, the gentle young Amish man who helps her lace her ice skates. You may purchase a copy at Herald Press. There was a time that I tried convince my husband that we should become Amish, maybe not Old Order as the author of this book is, but at least New Order. He shot me down – told me he’d tried to grow a beard and couldn’t and he had no interest in being a farmer. So that was that, I never did become Amish and now while I still respect their beliefs I’m glad for it, the Lord has me where he wants me but I still enjoy reading about the Amish whether through works of fiction or in this case an autobiography. Marlene walks us through her growing up years, years in which she grew up very, very poor and abused at the hands of those who were supposed to love and care for her. She had some good times but she longed to get away from her home so she became heavily involved in marching band becoming the head majorette. Ice skating one winter is when she met and eventually married Johnny Miller, an young Amish man who was living in the English world. 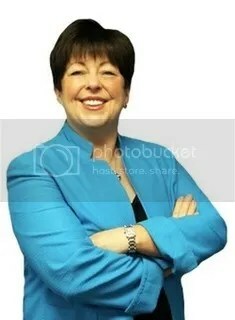 Marlene’s books tells me I’d probably love to sit with her and chat, she seems very down to earth and realizes that the Lord doesn’t want everyone that follows Him to be Amish. Her ‘kitchen sink conversion’ was hers alone and the Lord led her and Johnny to join and return to the Amish community and be reconciled to his parents. Being an Amish farmer’s wife with many children wasn’t easy, especially when her husband had to take on other jobs to support their growing family, but as she says if she’d known what the Lord had in store she’d probably not have gone Amish. I agree with her – if I had known what the Lord had in store for me these last few months would I still wanted to have loved and been married? Her doubts are honest and her fears real, but she always goes back to the One who can comfort and calm and that is where she and I get our strength. This was a fast read and even includes some pictures from Marlene’s child hood and teen years and some of her children before she and her husband became members of the Amish community. Her book reads like you’re sitting with her on the sofa and just chatting like old friends. She is honest about her feelings and her fears both as she strives for four years to be accepted and baptized Amish and even then after – her struggles of being a mom, farmer’s wife and so much more. 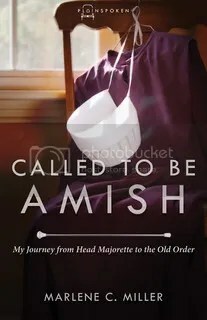 If you want an honest glimpse of Amish life coming from one who used to be English then this book is a great one, with honesty and faith Marlene tells her story of a little girl lost and becoming a woman found. If you’d like to see what other bloggers thought please visit the Litfuse Landing Page. Before I begin this review I want to be honest, I’ve only ever watched a couple of Duck Dynasty episodes – we don’t subscribe to cable and I don’t usually have time to watch shows. The ones I have watched my children and I really enjoy so when I had the chance from Family Christian bloggers to read and review this book I jumped at the offer. The Good, The Bad, and the Grace of God: What Honesty and Pain Taught Us about Faith, Family and Forgiveness is an awesome book on how two people that were broken, begin to heal with God’s help and become a stronger family because of it. I was pulled in from the first chapter – each chapter is either told from Jep’s or Jessica’s point of view and you’ll know before starting a new chapter whose view you’ll be reading. It was a relatively short and quick read – sometimes humorous, sometimes I had tears in my eyes – especially during the story of Jep’s medical crisis when the family didn’t know whether he’d leave the hospital alive. I’ve been there – sitting beside my husband as we wait word about what is going on, and then later being that widow. I could feel Jessica’s worry, her fears and ultimately peace when she leaves it in God’s hands. The book is honest, more honest than I think I ever could be in regards to my past and my skeletons – because we live in a world who wants to see us as horrible, unchanged, unrepentant sinners. 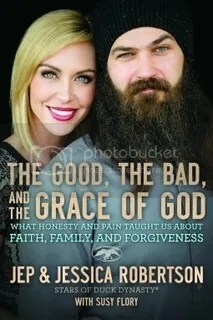 However, Jep and Jessica, seem to truly not care – their story isn’t for perfect people – it’s for those who have been hurt, who have pain and who want to heal like they’ve been healed – their story is told, not to recount every horrible detail or to ruminate on it all the time, but so that there story can help someone else. Whether or not one watched Duck Dynasty, whether or not one agrees or disagrees with their Christian worldview – if you’ve been hurt, if you’re still in pain and you want a story that shows how two people, one couple, keeps on going, then read this book! I appreciated how they didn’t dwell on facts, the story was there but it wasn’t written in a woe-is-me fashion or in a way that some continue to dwell on it while making the reader think they’ve been healed – it’s real, it’s raw and it’s all God. It’s great to read about their love for each other, for their children and for the Lord, even if it makes me miss my husband – I feel even more inspired to pass on our faith to our children so I can pass on our legacy. The questions and answers segment at the end is a great way to end the book and it makes them seem even more real than watching them on T.V. All entries will be verified. You will have 24 hours to respond to the email if you win, failure to respond will mean I pick a new winner. Void where prohibited. 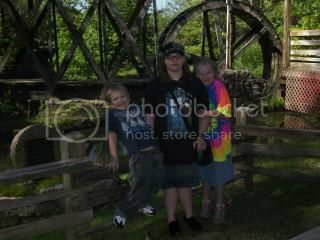 The question Mark and Jan Foreman are most often asked is: How did you raise your kids? Mark and Jan Foreman’s adult sons Jon and Tim Foreman of Switchfoot have influenced their world not only by a successful music career but also through their positive impact on communities around the globe. The Foreman parents instilled in their sons a belief that they could make a difference by living beyond themselves. This powerful book gives readers an inside look at the process. It begins with both parent and child finding their identity in God. It then explores practical ways to encourage holistic learning while cultivating specific gifts, nurturing creativity in a media-saturated culture, and balancing structure with individual choice. Never Say No inspires readers to raise children to live in the wonder of life by loving others well. Parents will find encouragement for their own parenting journey as they guide their kids to live out God’s purpose in radical ways. 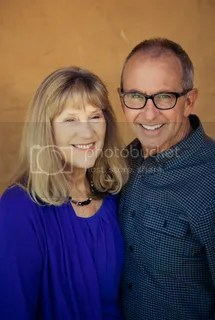 Jan and Mark Foreman live in the San Diego area, where Mark is lead pastor of North Coast Calvary Chapel. Mark is the author of Wholly Jesus, and holds advanced degrees in Theology, Education and a Ph.D. in Counseling and Pastoral Care. Jan is a gifted teacher, artist, and she also facilitates partnerships with underprivileged women and children both locally and in developing countries. Together they love surfing, sailing, travel and especially being with their family. 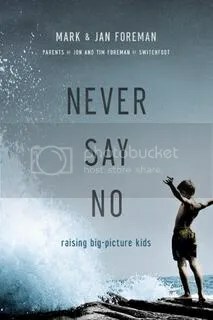 I requested this book because the title intrigued me, Never Say No, well how does one do that – as a mom of three children ages 13, 10 and 8 I say no….a lot. While I like the idea of not saying no there are still times that no is appropriate – like when my son thinks he needs a new pair of tennis shoes when he already has a play pair and a good pair. I have to pinch pennies – as a widowed mom I have to be careful so unlike Jan and Mark, I don’t have the means to make everything my children want to do become a reality. My girls are going to Detroit with their Dance Company, and that was a yes, a huge, yes but it also brings with it a HUGE financial commitment and so we’re fundraising for that, if there weren’t fundraising or relatives I would have had to say no. I get what the Foreman’s are trying to say, they didn’t want to limit their children’s (who are now grown) view of the world – but most parents I know aren’t going to just say hey, you want to do that, go for it – without looking at the cost involved and those may be more than just financial costs. I think the one thing I did glean from this book is I should say yes more – want to go to the park, yes. Can we take a walk? Yes. I do think that we, as parents, do say no too often and too much – saying yes gives us and our children more freedom. If there is a legitimate no, I don’t think giving an explanation of why is a bad thing either. Overall, this book was an interesting look into a new way of parenting – saying yes to our children. To see what other bloggers said visit the Litfuse Landing Page. You may purchase a copy on Amazon. I can’t remember how I met Mrs. Sharon White but I’m so glad I did as she has blessed me both through her blog posts at The Legacy of Home and through her other books, such as Early Morning Revival Challenge. 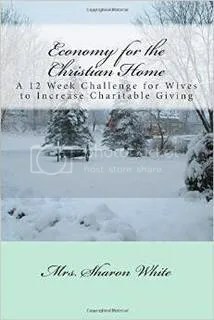 Mrs. White has written Economy for the Christian Home which is geared to increase the home’s charitable giving, and in turn bless others as Christ wants us to do. For the last 4 months I’ve been on the receiving end of charitable giving and I’ve been so blessed by all the gifts that have come in and as I need to watch the money that flows out it’s hard for me to let go of much, however Mrs. White’s book has me wanting to do more. I love the idea of a “charity box” or a Tzedaka box and am thinking of ways that we can make our own and start implementing it, as Mrs. White says “It can start with a penny…just one penny.” In Mark 12:43 even Jesus admonishes His disciples that the widow who gave her last two copper coins, which equal a penny, gave more than the rich people – so being a widow with little funds does not excuse me from giving, to the church or to others. Mrs. Sharon White writes with a simpleness that strikes to the heart of the matter and using much Scripture backs up all that she writes. Unlike, other books on giving, Mrs. White makes it seem doable because you’re not committing to hundreds of dollars, but even just a penny. That penny builds and builds and eventually the Lord will lead you who needs the gifting, whether it’s a family who needs food or medicine or your church’s food pantry. The discussion questions for each week are simple but in depth – you’ll study Scripture as well as what you just read in Mrs. White’s book and then the challenge will help you put both into practice – like week one, making a charity box or week nine’s challenge in learning a new skill (knitting, sewing, etc) that you can use to bless others. The book can be used either in group study or for individual study and comes with a financial journal (if doing this in a group, the journal is to be kept confidential) for each of the 12 weeks so you can track your expenses and giving. 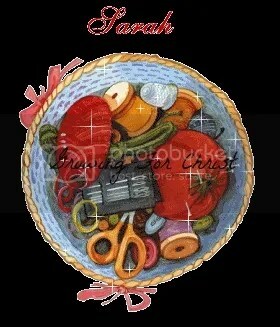 Economy for the Christian Home is a great resource for all Christian women who want to increase their family’s giving. They are the largest people group in the world without a homeland of their own. Despised and persecuted the world over, they even call themselves “the people without a friend.” Sadaam Hussein tried to wipe them from the face of the earth, killing several hundred thousand of them in the attempt. Their sufferings have become legend. They are the Kurds, descendants of the ancient Medes best known today from the pages of the Bible — inhabitants of what the world now calls Northern Iraq. Yet today the Kurds are rebuilding so brilliantly from war and oppression that even their enemies call it a “miracle.” Six star hotels stand where bombs once fell, shopping malls and gleaming schools rise where massacres once occur. National Geographic and Conde Nast have listed modern “Kurdistan” as a “must-see” tourist destination. You can purchase your own copy at Worthy Publishing. 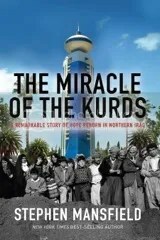 I’m going to admit that I knew little to nothing of who the Kurds were or even what Kurdistan is, so this book was highly educational in explaining all that to me and opening my eyes to this group of people who are blossoming as they come out from under a tyrannical government and also out from a war against the Kurds. I do remember Sadaam Hussein and the American troops finding him hiding in a hole in the ground but little do I remember of anything in any American news outlet and apparently that was just find with America as well as Sadaam. As I read this book, I couldn’t help but think of the Jews and many others lost during the Holocaust – Sadaam was an evil man, but I won’t tell the details here because I don’t think I could bear to repeat them. The author does a great job in tracing the Kurdish people’s beginnings and I appreciate that he began his timeline figures at 6300 BC instead of millions of years ago, but regardless of when the Kurdish culture began theirs is a story, like the Holocaust, that must be told so that everyone can learn from it and experience how down trodden people can fight back and not necessarily with weapons and rise up to become a mighty people. Stephen Mansfield also told of Christians who came to live among the Kurds and help them – the Kurds have made Islam their own and it’s not the kind that is akin with ISIS or other terrorist groups. Missionaries come and are welcomed with open arms – not for the help they bring but because it seems, Kurds, love and welcome everyone. There is pain in these pages but if you can look past the pain, don’t forget it though, and see the Kurds as a people, as a person (the author gives the reader a ‘visit’ with several Kurdish men) and see how they’ve overcome severe oppression, hatred and almost complete extermination then this book will not only be an educational one but one that will open your eyes to a people who still need our prayers and our help. One won’t simply see them as Muslims or a non-Christian, you will see them as your fellow man, suffering, and come to identify with them. Of course, it’s also a book if you don’t want to be educated beyond what the media allows you to know and if you don’t want your heart opened to those needing help far from you, leave the book where it is and move on. It took me time to get through this book because it isn’t a quick read, I don’t recommend reading it in bed, but I do recommend reading it. Johann Christoph Arnold, whose books on education, parenting, and relationships have helped more than a million readers through life’s challenges, draws on the stories and voices of parents and educators on the ground, and a wealth of personal experience. He surveys the drastic changes in the lives of children, but also the groundswell of grassroots advocacy and action that he believes will lead to the triumph of common sense and time-tested wisdom. 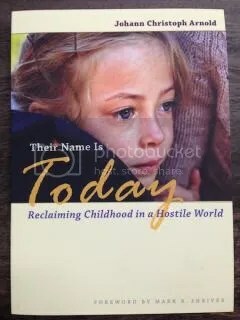 Their Name Is Today takes on technology, standardized testing, overstimulation, academic pressure, marketing to children, over-diagnosis and much more, calling on everyone who loves children to combat these threats to childhood and find creative ways to help children flourish. Every parent, teacher, and childcare provider has the power to make a difference, by giving children time to play, access to nature, and personal attention, and most of all, by defending their right to remain children. You can purchase a copy at Plough. People have come to expect sound advice from Johann Christoph Arnold, an award-winning author with over a million copies of his books in print, in more than twenty languages. A noted speaker and writer on marriage, parenting, education, and end-of-life issues, Arnold is a senior pastor of the Bruderhof, a movement of Christian communities. 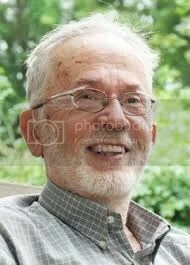 With his wife, Verena, he has counseled thousands of individuals and families over the last forty years, as well as serving as an advisor at several innovative private schools. Together with paralyzed police officer Steven McDonald, Arnold started the Breaking the Cycle program, which brings the positive answer of nonviolent conflict resolution and forgiveness to schools, to counteract the fear of school shootings, as well as gang violence and bullying that affects children, teachers, and parents. Promoting reconciliation, he has spoken with students at hundreds of public schools. This work has also brought him to conflict zones from Northern Ireland to Rwanda to the Middle East. Closer to home, he serves as chaplain for the local sheriff’s department. Arnold’s message has been shaped by encounters with great peacemakers such as Martin Luther King Jr., Mother Teresa, Dorothy Day, César Chavez, and John Paul II. Born in Great Britain in 1940 to German refugees, Arnold spent his boyhood years in South America, where his parents found asylum during the war; he immigrated to the United States in 1955. 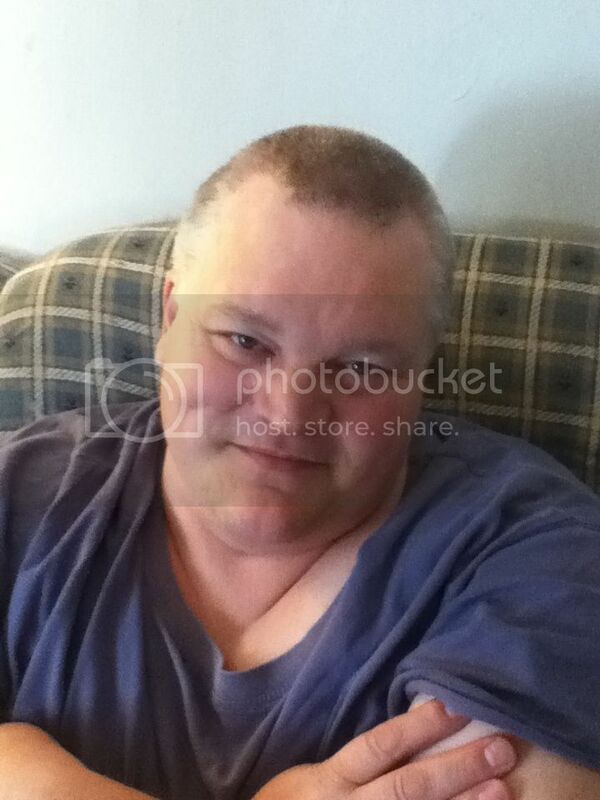 He and his wife have eight children, forty-four grandchildren, and one great-grandchild. They live in upstate New York. I wanted to really like this book – after all I do believe all children are precious, although there are some that I would rather not be around or have my children around – but yes, they are all precious and should be respected for the individuals they are. I read this book through a Christian, homeschool viewpoint so reading this book which touted teachers as great beings in our children’s lives was hard to read. Now don’t get me wrong, I’m not saying teachers aren’t great, because I had a few good teachers during my time in public and private school but a quote from a teacher, “These are the parents who worry me the most – parents who won’t let their child learn. You see, teachers don’t just teach reading, writing, and arithmetic. We teach responsibility, organization, manners, restraint and foresight”. So in essence teachers teach the things that parents are supposed to – in all my years in a brick and mortar school not one of my teachers, even the good ones, taught anything but the subjects they were required to teach, because it was the parents job to teach the other stuff, thankfully I had parents who did teach my siblings and I those things and cared, not every child gets that. Mr. Arnold also calls for no screen time, admitting his own children didn’t learn typing until they were in middle school and then they still had to rely on the library for their sources when writing papers – the internet wasn’t allowed. Televisions are also a no-no as are electronic reading devices, tablets, video games and so on – in our house the television is not just used for entertainment it is used also as an educational tool for watching documentaries on periods of history that we are studying, active video games are used for physical fitness when the weather here doesn’t permit a lot of time outside. I’m all for limiting access to technology – the T.V. is off for the greater part of our days and we don’t plan our schedules around it and my children know how to interact with all ages. I’m sure that for some families the television and ‘screen time’ as it’s called in the book are bad things for some children and in my experience that is usually the children who are enrolled in a brick and mortar school, it is not so much true for those who have chosen to home educate. It seems that Mr. Arnold has a more liberal view on raising children, he advocates discipline and consequences but then also goes on to say that parents should never use a negative attitude toward children. If a child does something wrong we should not say that we are disappointed in their choice or show any sort of negative reaction because then said child may begin to act out – the child should feel only love, “happiness and security, generosity and optimism” – to me that is not correct as the child is going to become an adult at some point and not everyone is going love them, make them happy, provide security so shouldn’t within reason children learn to deal with these feelings with their parents? “After parents, the relationship of greatest influence is often that of child and teacher”, and then he quotes Carl Jung (quite a few of the quotes are from those who were liberal in their views) – shouldn’t the single most greatest influence be us, the parents? I understand, unfortunately, not all children are born into families where they are wanted or loved or educated, but in a perfect world the greatest influence should be the parents and of course the Lord. Mr. Arnold though, as I have learned lives within a closed community called the Bruderhof and all children go to the community’s school – so I’m sure the teachers there are lovingly and carefully picked, but that type of setting is not replicated within the outside societies schools. I’m sad to say that I really didn’t find anything that I totally agreed with in his book, I don’t believe that teacher’s are somehow above the parents (although the government would love us to believe that, and some have), I don’t believe taking away all screen time is valuable or conducive in today’s world (if so my oldest would have missed out on writing her first novel) – although I do agree with him that there are children who are unloved, left alone, scared and floundering in the world – but they also flounder just as much in schools (ask me how I know) as they are left behind in a system that has failed them both in school and at home. This book may be a great one for those whose children are in school for 9+ hours a day, for a teacher who works in a brick and mortar school, but for this mom who loves her children, corrects them as needed, brings them up in knowing the Lord and also educates them this book just rubbed this mom the wrong way. Words all over the place. Accusing, blaming, and degrading words are the worst of all. After hearing those words over and over again, we begin to feel the weight of them threatening to crush the very life out of us. Buried Beneath the Words cleverly shares a true life story about the different ways someone can end up buried beneath the weight of negative words. Then it shares a Christian course for how God’s word can revive us. By putting the advice given within these pages into practice, you will experience an awakening of the real you—the you that has been buried way too long. You can purchase your copy at Betel Arnold’s website. Betel Arnold is a Certified Christian Life Coach, her passion is to reach out to women with compassion, empathy and encouragement. 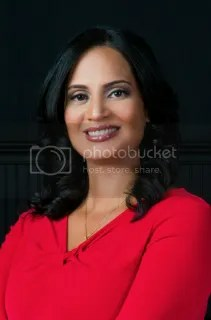 She is the creator, co-producer, and co-host of Simply Talking, a local public television show addressing issues drawn from our daily lives to deeper questions that come from our personal tragedies. Betel has learned to integrate her roles as wife, mother, inspirational speaker and family advocate. It is Betel’s personal life experiences of overcoming adversity where she was able to find the inspiration and inner strength to do the impossible. She inspires others to overcome the challenges that keep us from moving forward in our lives and achieving our goals. Betel Arnold has embraced her life’s conviction to help women become all that God has called them to be. 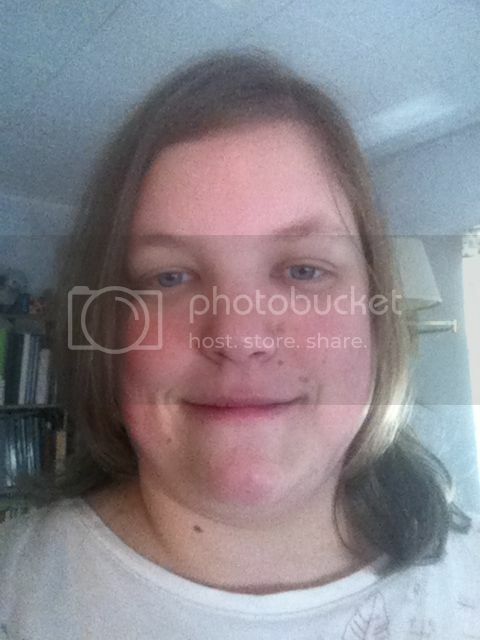 You can learn more about Betel on her website, Facebook and Twitter. I think we all have had word hurled at us – whether they be from well meaning parents or not so well meaning parents, friends, bullies and others around us – that still torment us today. I know I have. I was told to let the words roll away, part of the whole sticks and stones will break your bones but words will never hurt – there were days I almost wished that I’d have a broken bone versus the words that weren’t supposed to hurt. Words wound even more than a broken bone – a bone can mend and heal but it takes more than plaster and water to heal an emotional wound. 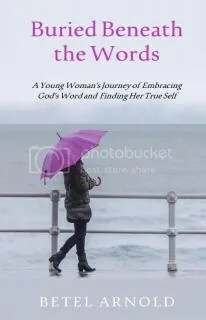 That is what Betel’s book sets out to do to help heal those wounds caused by words by using God’s Word so that we can know and love ourselves as He loves us. It’s a short book – I read it in one sitting for the purposes of the review – so unless you do the journal exercises it doesn’t take long to read and apply what you’ve learned. Betel is very open in this book, sharing some of her own personal experiences with how words had hurt her and continued to do so well into her adult life. I can relate. I was told I’d never do anything or be able to graduate college from a high school teacher. Well I did graduate college and I’m successfully teaching my own children and training them to love and serve the Lord. That doesn’t even begin to touch the bullying I encountered in school that I carried around for many, many years – and Satan still tries to use them to attack me. The journal exercises are fairly easy and quick such as writing down negative words that have affected you and then making a list of words and phrases you had heard instead. They aren’t painful or long, but they can aid in healing. Betel also speaks of Confession, not where you go to a priest but where you pray God’s Word over your life and she gives a list of her confessions in the back of the book – it’s a great way to really understand her way of confessing. Okay, now because I’m a bit more conservative in what I like in my Christian books I did find a couple things that I do want to warn my fellow conservative readers, on page 34 in my book, Betel is recounting a conversation she’s had with her sister and the use of “Oh my ***” is used. As I don’t use this as I believe it’s blaspheming I do admit I was shocked by the use of this, even if that is the way the conversation happened it still could have been omitted or altered and the book would not have been changed. On the next page as she recalls a conversation between her and her brother she uses the word p****d and again I had a feeling of shock – I know their are Christians who don’t feel this is a cuss word but it’s not exactly a nice word either. There were two other issues but overall, the book has a niche to fill and it does it well – overlooking the issues instead of throwing the baby out with the bath water, as I know Buried Beneath the Words can and will help many women overcome their issues with words in their life. If you’d like to see what other bloggers thought of this book please, visit the Litfuse Landing Page. Welcome to the blog tour and giveaway for Betel Arnold‘s debut book, Buried Beneath the Words. Enter today by clicking the icon below. But hurry, the giveaway ends on October 12th. Winner will be announced October 13th at Betel’s blog. Don’t miss a moment of the fun; enter today and be sure to visit Betel’s blog on the 13th to see if you won! In today’s fast-paced and technology-driven times, Christians feel stressed out and overly busy. Many are left longing for simpler days, unaware that these days are within their grasp, made possible by getting rid of spiritual and material clutter. clear out unnecessary clutter in my home? rely on God for my sustenance? get free from too much technology and/or entertainment? free myself from the stronghold of materialism? Sharing their insights to help readers break free of anything that enslaves them, Pam and Chuck empower Christians, both materially and spiritually, to live a clutter-free life. Normally I don’t enjoy books that talk about simplifying or how to rid myself of unnecessary things in my life but I wanted to see what the authors had to say. I’m glad I did! I really think this was God’s way of telling me I needed to rethink all the things I’ve been accumulating and start simplifying my life. God talks to us all but sometimes we ignore Him because we don’t want to hear what He has to say, even if it would make our lives better! Reading this book was fun and easy and gave me lots of ideas on how to reduce my clutter – and I don’t have to get rid of everything, however I can if I want. I really enjoyed the fasting chapter (such as fasting for a time from internet or if that is too much then fasting from Facebook) and the money and possessions chapter both spoke to me. I think this is God’s way of paving a path for me to be more simple. A good thing since I enjoy learning about the Anabaptist way of life but have no way to convert (that was sort of a joke). Overall, I do recommend this book who want to learn more about simplifying from a Christian perspective but need to do it slowly so as not to totally overwhelm themselves. When a Christian looks at something from a Biblical standpoint I think it can make it easier to implement and that is the way with this book. 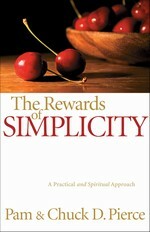 The authors talk simply, not simple as in they think we won’t understand, but simply in that they don’t want to make it a burden to simplify our lives. 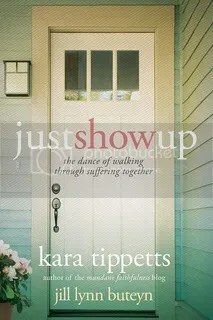 **I received this book through Bethany House’s review program in exchange for my honest review.